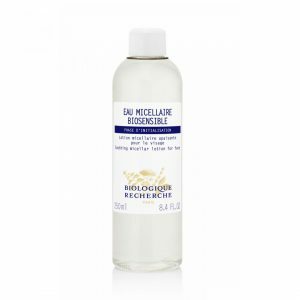 The Eau Micellaire Biosensible is our sensitive skin rescue cleanser. This cleansing micellar water, will instantly capture impurities and makeup, whilst soothing, hydrating, toning and refreshing your skin. Less is more with sensitivity, this gentle formula respects the physiological balance and hydrolipidic film of sensitive Skin Instants®. Packed full of hyaluronic acid, peptides derived from plants and amino acids, your epidermis will feel supported, soft and comfortable. If you are after a quick makeup removal option, this is also the perfect product for you. Makeup-removing agents: Derivative of Apple Juice, Herero polysaccharides and peptides derived from plants. Soothing agents: Extract of Rhamnose, Complex of aminoacids. Moisturising agents: Hyaluronic Acid and Rhizobium Complex, Plant-based polysaccharide. Toning agents: Essential Oil of Peppermint (mentha viridis), Essential Oil of Grapefruit.